Many years ago I made a promise to God that if He ever wanted me to share with others the things He was teaching me, I would do it, even if it was embarrassing. I do not have it all together, but God has graciously been using His Word to teach me and guide me toward becoming the woman, wife, and mother He created me to be. It was true. There was a part of me that really did expect them to be perfect. Why was I surprised that my children, who are naturally sinful, continued to sin? I would never have verbalized such an irrational thought, but much of my parenting was driven by this hidden expectation. I envisioned that I could train selfishness out of my children, even as I struggled with selfishness myself. The Lord needed to show me that my children will grow into imperfect adults. He has called me to guide them, love them, and walk with them as we grow together toward the image of Christ. So if biblical motherhood is not perfect motherhood, then what is it? A biblical mother is a woman who has rightly ordered her loves. The first love of a biblical mother is her love for God. Although this may seem backward, I want to point out a portion of Scripture that shows us the opposite of biblical motherhood. It is found in 2 Kings 17:27–33. In this passage, God shows what happens when we mix faith in God with idols of our own making. The people mentioned here became so deceived, that in order to show their devotion to idols of stone, they sacrificed their own children in the fire. Because their love was not for the Lord alone, their children suffered. I first read this passage after Rob and I had a big argument. I do not remember what the argument was about, but he was not responding the way I wanted. He went upstairs and I stayed downstairs to sulk. However, after bringing my emotions and anger to the Lord, He led me to this text. Parents in those times were no different from parents today. What would have possessed a mother to do such a horrible thing? How could a mother be so deceived that she would kill her own child? I was angry at these parents who would do this for a stupid idol. Then the Lord spoke to my heart. “Amy, you are no better.” I was shocked. What on earth did God mean by that? God was trying to tell me that in a sense I, too, had sacrificed my family for my own idols. Suddenly, the argument with Rob came into a completely different light. I realized that I had treated him terribly because I had been serving my own idol of pride. At that time in my life, I cared deeply about the praise of others. If Rob did something that, in my mind, tarnished that praise, I was not pleased. I sacrificed my children to my idol of pride as well. I occasionally made parenting decisions out of a desire to please others and to earn their good opinions. When I was in public I sometimes handled discipline situations differently, to show others what a good mom I was. When people would give me advice about my marriage or my parenting, I sometimes followed it just to please them so they would think well of me. I was sacrificing my family to my own idol of pride. If God is not our first love, we risk sacrificing the things that matter most. A few years ago, I was talking with a friend who ran a day care center in her home. At that time she was caring for a two-year-old girl and began questioning whether it was in the girl’s best interest to be there. She shared her concern with the mother who replied, “Well, I could stay home with her, but I love shopping too much.” There are certainly situations where day care is needed to provide financially for the family, but for a love of shopping? That woman may one day look back and see that she sacrificed something she cannot regain. As parents, it is possible to worship God, yet at the same time to serve our idols, which ultimately invites our children to follow the same path. Ask God to search your heart. Is there anything in your life outside of Him that you are counting on for your sense of meaning and significance? Idolatry is trying to meet our deepest needs apart from God. Ask the Lord to show you the things you may have put in His place such as possessions, children, husband, physical fitness, social status, or even food. Thankfully, God invites us to come to Him and confess that our hearts are divided. His forgiveness and power to change us are boundless. 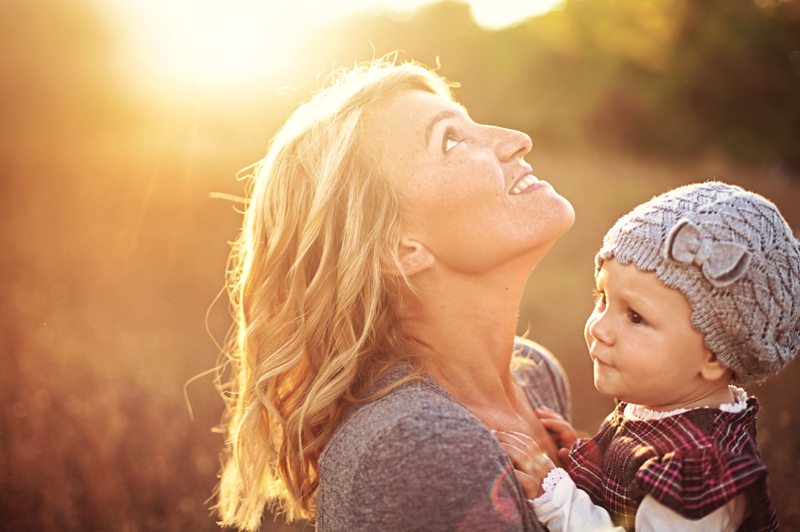 A biblical mother is passionate about God and desires to keep Him first in her heart. This is the first and most important step toward passing a love for God to our children and grandchildren.